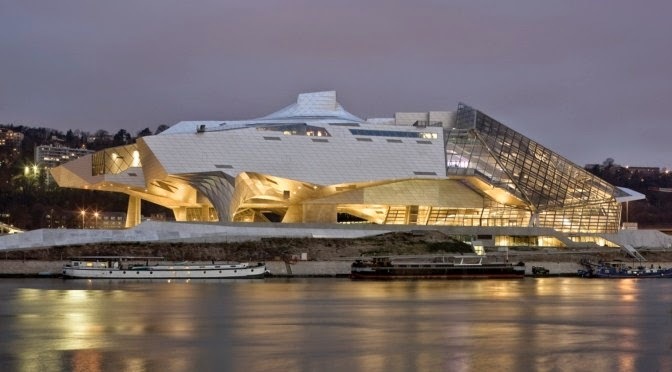 MUSÉE DES CONFLUENCES BY COOP HIMMELB(L)AU Archi-new - Free Dwg file Blocks Cad autocad architecture. Archi-new 3D Dwg - Free Dwg file Blocks Cad autocad architecture. The striking interface situation of the construction site at the eponymous confluence of the Rhône and the Saône inspired the superposition in urban space of two complexly linked architectural units, crystal and cloud. The cloud structure, floating on pillars, contains a spatial sequence of black boxes— admitting no daylight, so as to achieve maximum flexibility for exhibition design. By contrast, the crystal, rising towards the city side, functions as a transparent urban forum; it faces the city and receives visitors. Also decisive in the selection of this concept was the manifold connection of these two units through the Espace Liant: It leads in a loop, as a corridor or over bridges and catwalks, from the crystal to the other end of the cloud. It functions as an additional means of access between the exhibition spaces that are directly connected to one another—a mellow space of hidden currents and countless transitions. In a continuation of the park from the southern tip of the island, an expansion of the urban space is formulated: a landscape of ramps and levels that dissolve the boundary between inside and outside into a dynamic sequence of spatial events. This movement continues on the inside in the alternating spatial structure of the exhibition spaces. Hard Space – Soft SpaceThe Crystal performs like an urban square, receiving visitors and preparing them for the museum experience. It is oriented toward the world in which we daily evolve; its contours are precise; its form is crystalline and measurable. This crystalline nature results from its glass-and-steel construction. Large panes of glass are mounted in steel frames: assemblages that, by virtue of being resistant to flexion, make the various folded surfaces seem reflective. The Gravity Well —a central element— provide a refrain both to the structural efforts and to the luminous sculpture. The Cloud, by contrast, resembles an immense spaceship, stowed temporarily in present time and place, its deep entrails harboring the exhibition spaces. There are ten exhibition spaces on three levels, as well as an upper level of administrative offices.